Nowadays everybody is talking about entry tests. 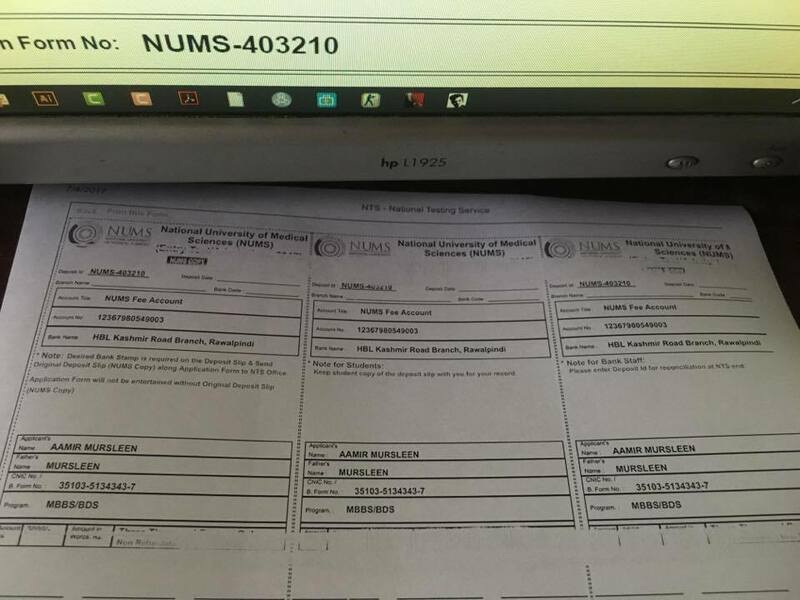 And a student becomes scared when the word Entry Test stumbles upon his ears especially this NUMS Entry Test. Because you have completed 12 years of education after a lot of hard work and dedication, but now the most terrifying part starts - Entry Tests. 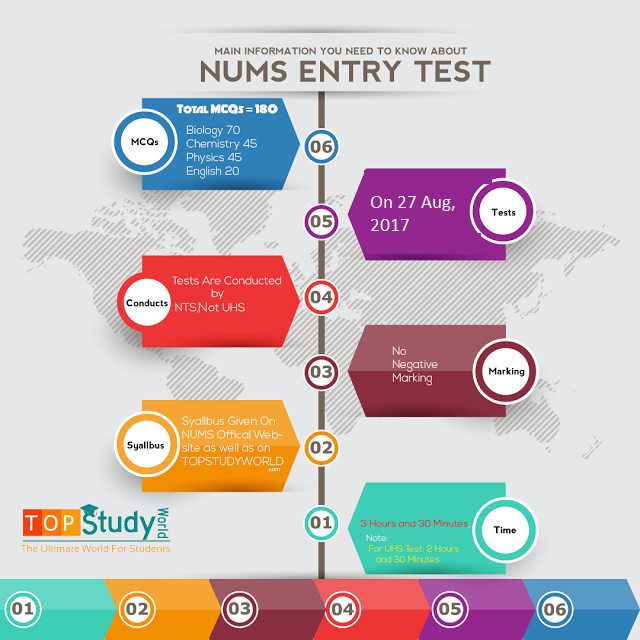 We have already talked about why NUMS was established, here is the brief introduction of NUMS Entry Test in the form of infographics made by Top Study World. What are the basic qualification and eligibility criteria for the NUMS test? Minimum 60% aggregate marks each in Matric, F.Sc (Pre-Medical) OR Equivalent. Candidates awaiting the result of Intermediate (Pre-Medical) annual Examination 2019 can apply on the basis of F. Sc Part-I. However, confirmation of admissions is subject to the provision of F.Sc Certificate with detailed marks Certificate. Candidates of A level (science group)or equivalent qualification, appearing in final examinations, can apply on the basis of O level/equivalent qualifications and equivalence certificate from Inter Board Committee of Chairmen (IBCC) office but confirmation of admissions will be on the provision of equivalence certificate for A Level /equivalent qualification. Foreign Students can apply on the basis of SAT-II Examination with the minimum score of 550 marks in each of the three science subjects of which two have to be Biology and Chemistry OR MCAT with minimum aggregate score of 24. 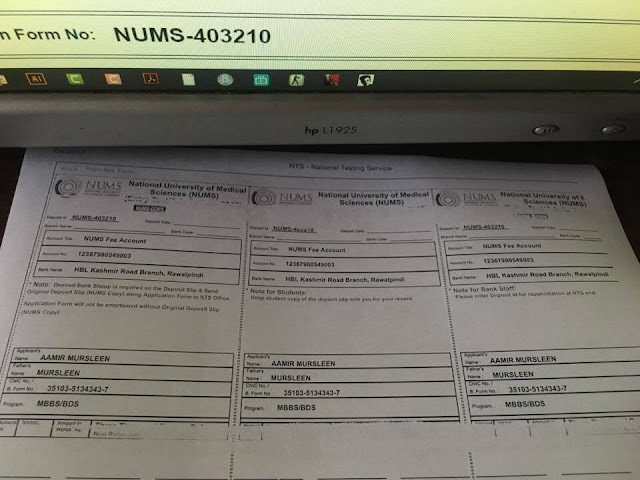 What is the syllabus for NUMS Entry Test? When the test will be taken? Entry Test will be taken on 27 Aug 2019 (expected). Only one test will be taken, not two, unlike the previous year. What are the fees for the entry test? When will the merit lists be displayed? What is the format (or pattern) of the NUMS Entry Test? What is the aggregate percentage for NUMS Entry Test? Go to NTS, and click "New Projects." 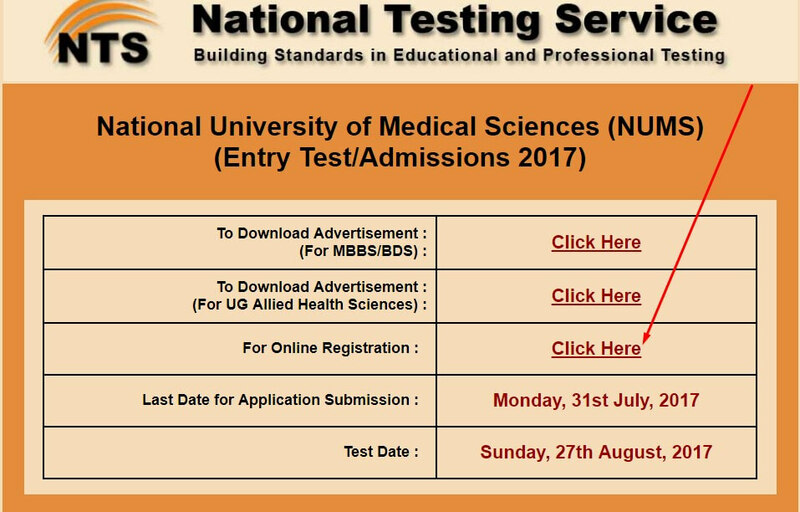 The Project detail "National University of Medical Sciences (NUMS) (Entry Test/Admissions 2019)", and now click "Click Here." Now click for Online Registration. It will redirect to another page. Application Form should reach NTS office latest by the last date of submission of Registration Form. Last Date of Submission of application form is Monday, 31st July 2019. After Sign-up, you can Log-in to continue with the application form for the selected admission-program. However, to apply for another program, you will have to Sign-up again. Once you clicked Sign Up (it will feel like you have refreshed a page, it will not give you the message that your account has been created. rather you have to assume by yourself once it loads again), then apply the same information for Login that you provided while filling the sign-up form. The information that I filled here is not accurate rather this article is for the educational purpose only. Then you have to read the instructions and check the box and click continue.Don't worry, it will be explained with pictures. Fill your information carefully and proofread it before submitting your Online Application. You must upload your photograph (passport size only); otherwise, your application will not be processed. Click the submit button only once, sometimes application submission can take few minutes if you are using a dial-up connection, so be patient. Please make sure that the "Deposit Id" on the application form should be same as allotted to you at the time of registration. "Do not use the application form of any other candidate." Keep a photocopy of the Application Form with you for your record. After uploading your photograph online, please also attach your 2 recent photographs on the printed application form. Please send the application form with the original deposit slip (NUMS Copy), two passport size photograph and copy of CNIC / Form "B" to the address given below latest by " Monday, 31st July 2017." After that, you have to complete the Test Information and Personal Information under Application Form. Then you have to submit. It will lead you to the printed page like below screenshots. It has two pages: Challan Form (Deposit Slip) and the Admission Form. Copy of your CNIC / Form "B." Make sure, your parcel is sent before 31 July, otherwise you will not able to take the test at any cost. 1. 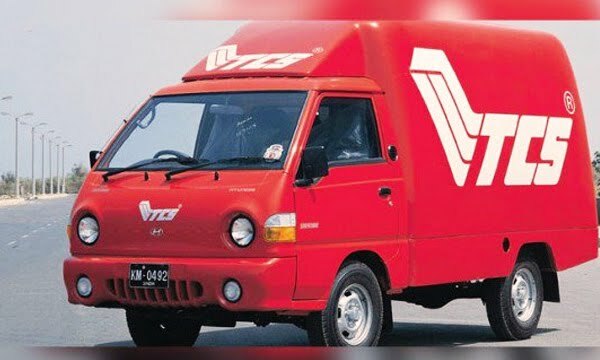 NTS will dispatch Roll No Slips to all the eligible candidates through courier. 2. Candidates are required to bring the printed admit cards to the test center along with original CNIC or form”B” or an original document with a photograph like; passport, etc. as per instructions by NTS. 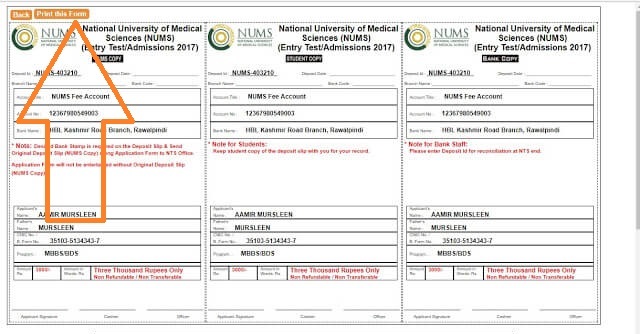 What is the Admission Process for NUMS test? 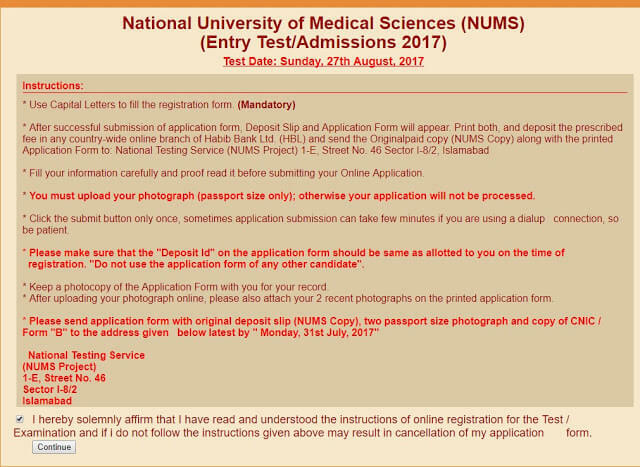 For Army Medical College, Rawalpindi: Admissions process for Army Medical College will start after the declaration of NUMS Entry Test Result. Prospectus including sample applications forms will be available online as well as at Admissions Office NUMS, Military Hospital, Rawalpindi Cantt. Admissions are based on open merit from all over Pakistan, including Azad Jammu Kashmir and Gilgit Baltistan. 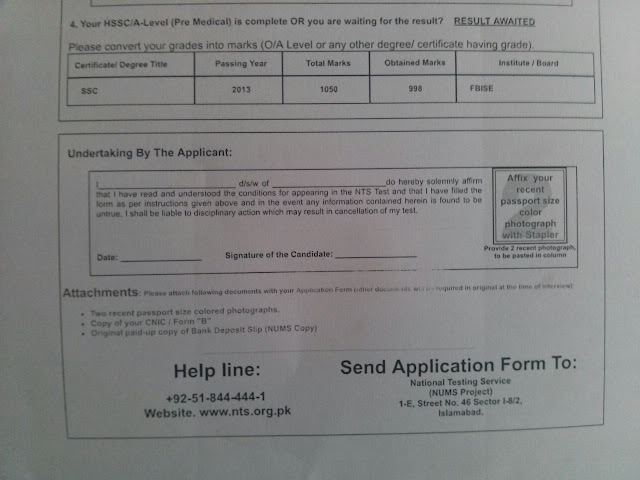 All foreign qualifications must be supported by an Equivalence Certificate issued by IBCC. The decision of the NUMS Admissions Committee shall be final. Admissions in Affiliated Medical Colleges will be advertised by respective institutions separately. For admissions in NUMS, Affiliated Colleges candidate will apply directly to respective institutions with NUMS Entry Test Result. What is the Next Step after Entry Test? The admissions in Army Medical College (AMC) and other colleges under NUMS will open. You have to apply Separately in each college you want to get admission. In NUMS Army Medical College Rawalpindi, applications can be submitted from 11-29th September 2019. Step 1: Apply for the online request for a prospectus. You can also get it by visiting NUMS personally. For online request for prospectus Click Here. Step 2: Once you submitted the request. Then wait for 24 hours to get the prospectus. Step 3: When you get the prospectus, look for ARN (Application Registration Number) on the very first page of the prospectus given to you. Step 4: Now, Apply for by filling Online form for NUMS. To fill the form Click Here. For the official website, you can visit NUMS. How to Apply for Affiliated Colleges of NUMS? You can apply for affiliated Colleges of NUMS in the same way. You have to buy their prospectus separately and register on their website. 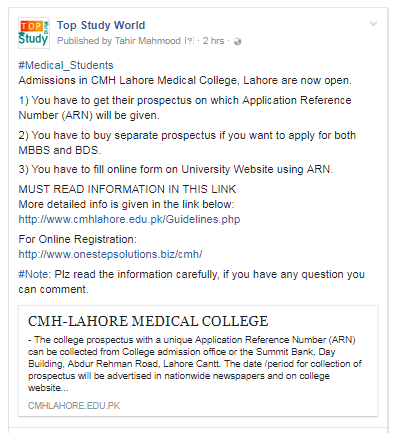 Admissions at CMH Lahore Medical College are open now. 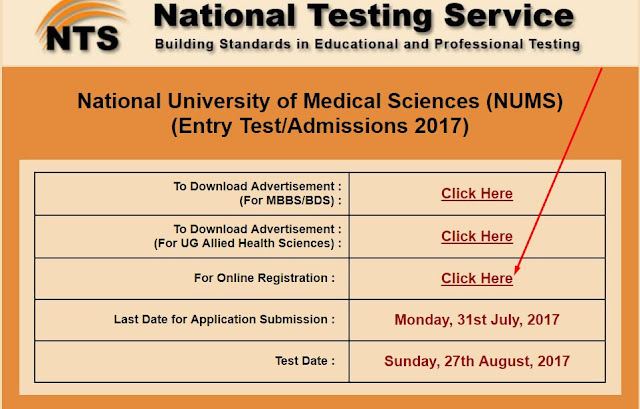 Similarly, you can apply in other Medical Colleges who are affiliated with National University of Medical Sciences (NUMS). 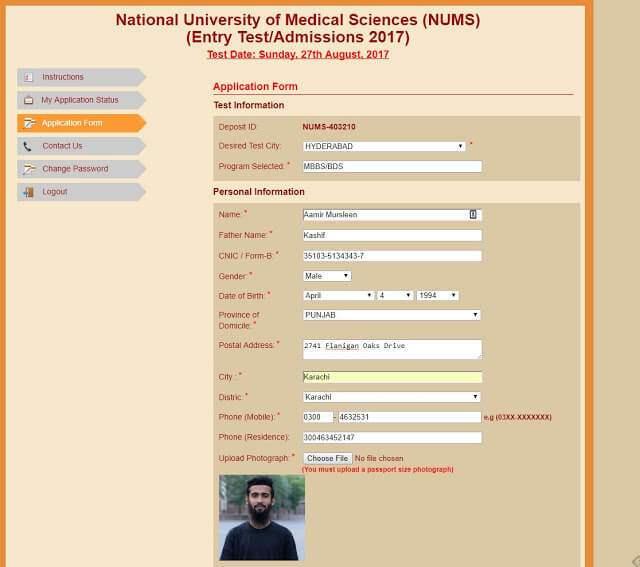 First time in Pakistan, a step-by-step guide with pictures for applying for NUMS admission. We explain the best!